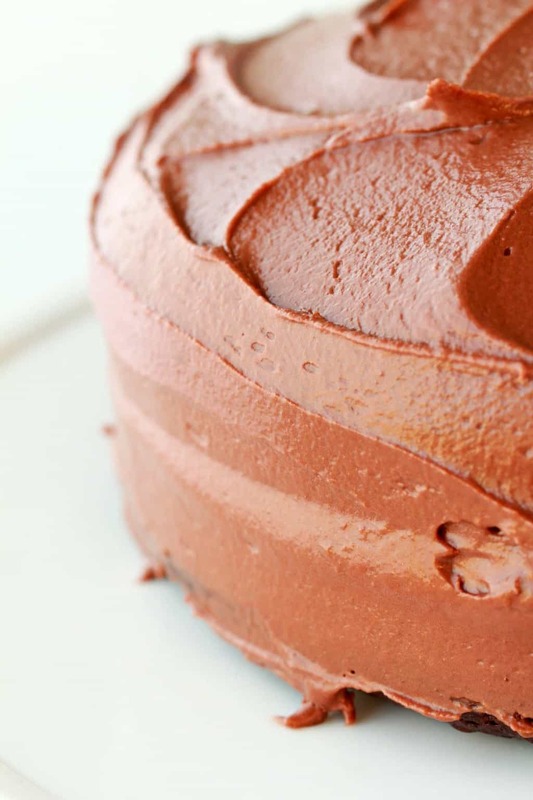 This super simple vegan chocolate frosting is absolutely gorgeous on…. 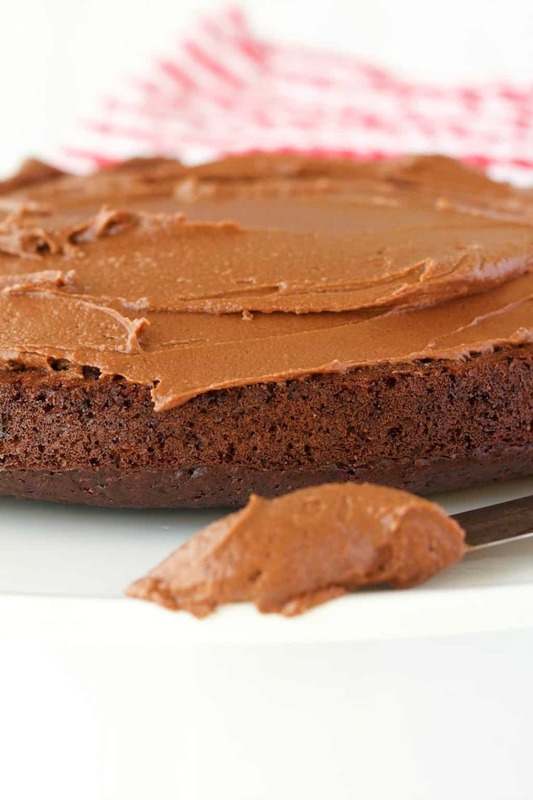 you guessed it – a vegan chocolate cake! 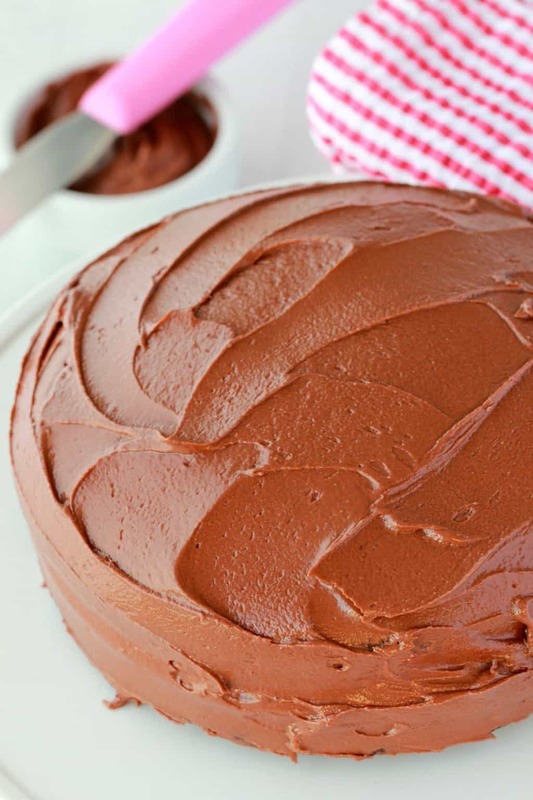 What you’ll love about this frosting is that it’s so easy and quick to prepare, and the result is rich, chocolatey, dark and creamy, with a hint of buttercream richness and hints of vanilla. 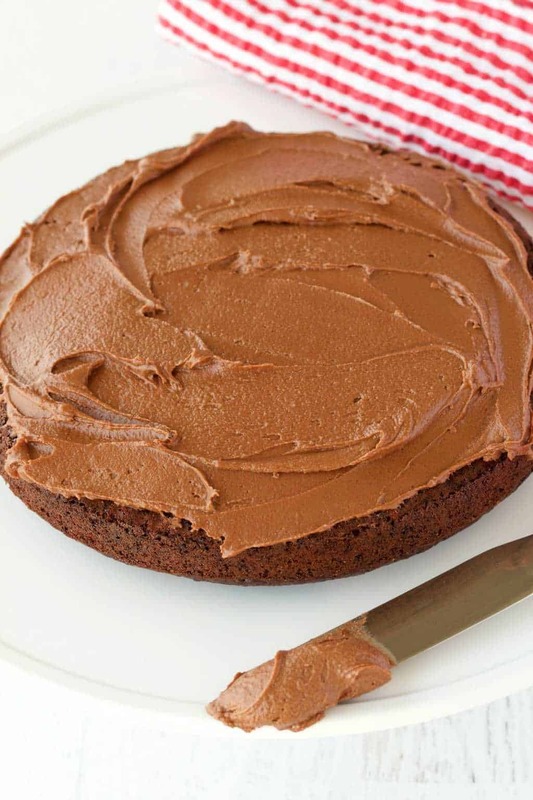 This recipe is a simple 5-ingredient mix of powdered sugar, cocoa powder, vegan butter, vanilla and non-dairy milk (any non-dairy milk will do). 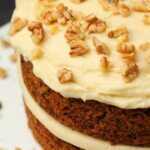 It’s divine on a chocolate cake, but of course you can mix and match and use it on a vanilla cake too! It’s also perfect to pipe onto cupcakes and holds up really well. The ideal is to make it as thick as possible, but still spreadable. I have on occasion made it too thick so that once it goes into the piping syringe it won’t come out again! It’s just too thick! If that happens, add some more non-dairy milk, a drop or two at a time until you get the right consistency. And if it happens to end up too thin, add more powdered sugar until it’s the right thickness again. 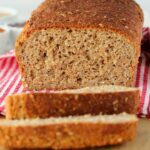 With a bit of flexibility to get the right texture, this is really a foolproof recipe. If you refrigerate this frosting, it gets a delicious crystalized texture on the edges, which I love and is so great on cakes. 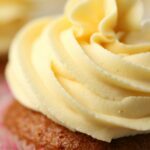 Want more vegan frosting recipes? 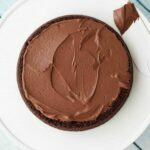 For more delicious vegan chocolate frosting recipes, check out these frostings on some of our cakes! And once your cake is frosted, you get to decorate it, and that is too much fun! 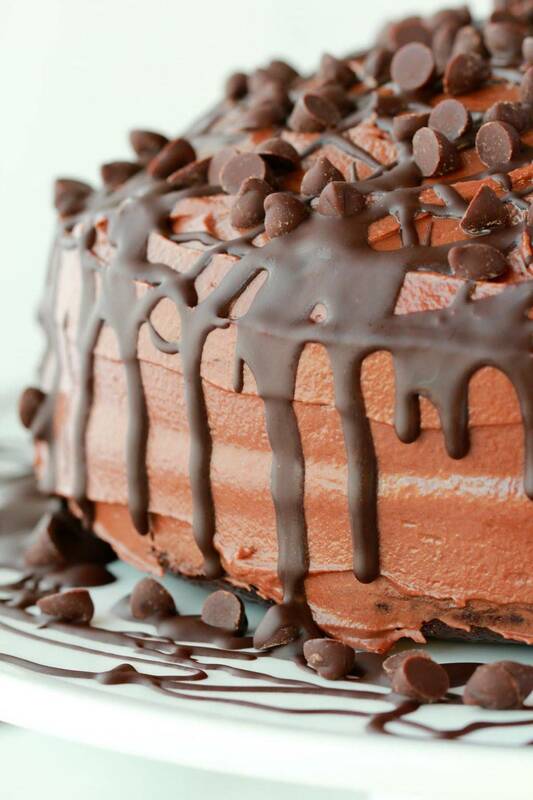 My latest favorite decorating technique – melted chocolate drizzled over it with chocolate chips sprinkled over the top! So decadent looking! Also it suits my decorating style which leans more towards the messy side of things! Sign up to our email list for a free recipe ebook containing 10 awesome recipes and you’ll stay updated with all our latest recipes. 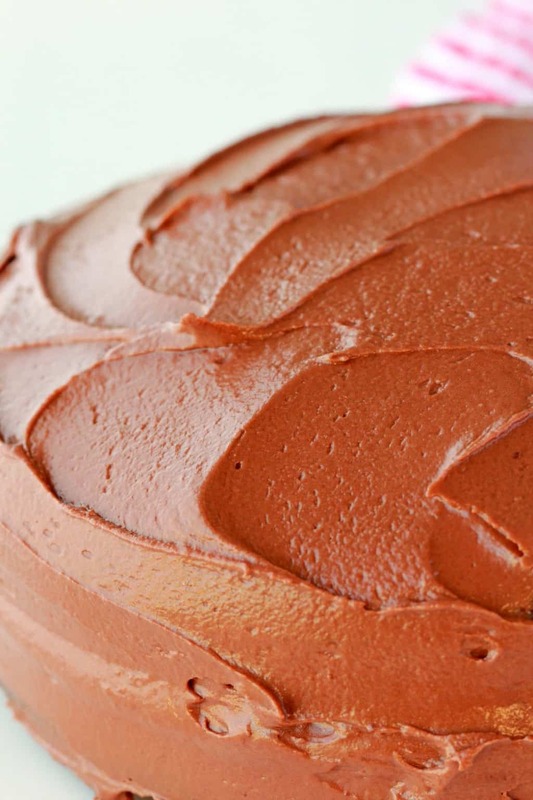 5-ingredient Vegan Chocolate Frosting recipe that is ready in minutes. Perfect for use on cakes, cupcakes and cookies. Add the powdered sugar, cocoa powder, vegan butter, vanilla and around half the soy milk to the bowl of an electric mixer. 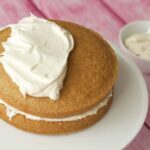 It should be thick, but still be easily spreadable so it won’t go sliding off a cake. So if it’s not thick enough, add a little more powdered sugar. 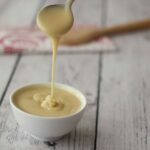 *I usually use 5 Tbsp soy milk in this recipe, but different brands of vegan butters have different water contents, so if you’re using one with a higher water content and use all 5 Tbsp soy milk, you might have a consistency that is too runny. So start off slow and only add in all the soy milk if you need to. You want your frosting to be thick, but still spreadable. I see a few of your recipes call for vegan butter. Is it something you can make or do you buy it? Hi Marida! It’s something you buy. Here in Dubai we get an Australian brand called Nuttelex, but of course different countries have different brands. So it’s basically any type of butter that is made to be vegan 🙂 Earth Balance is a popular brand in the US. I’m in South Africa, so I’ll just have to find something suitable I guess, can’t wait to try this! Apparently the brand ‘Ole’ is vegan. Not sure of any others. there was no reply to this. Did you try it? 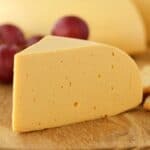 I am going to try it tomorrow with Becel vegan margarine. Hi Ella! 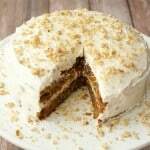 This is a vanilla cake and the recipe is here: https://lovingitvegan.com/vegan-vanilla-cake/ 🙂 Update: The photos have been updated and the cake in the photos is now our Vegan Chocolate Cake. Can we pipe with it? 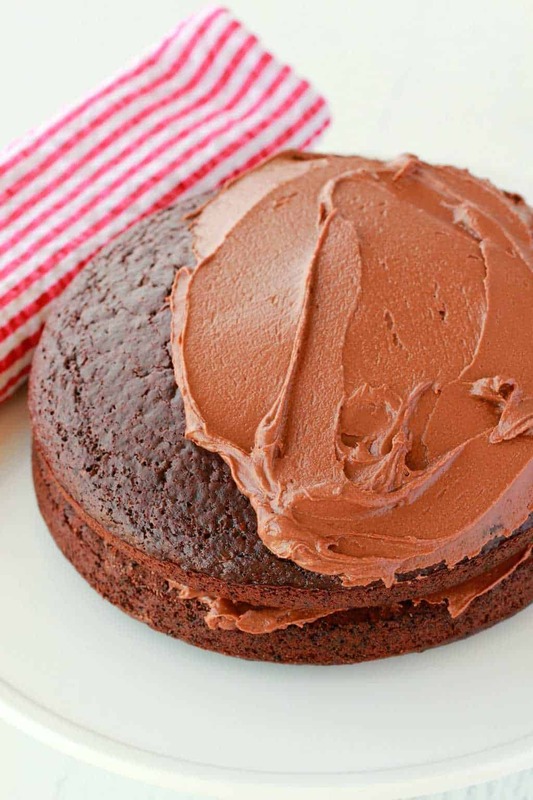 Can I use the frosting to coat my cake, then cover with modelling sugar free chocolate as fondant and decoration? Hi there – I’m wondering if this frosting is room temperature stable as it has vegan butter and non-dairy milk in it. 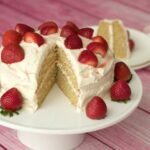 In my experience with dairy free/vegan frostings, once these ingredients are added, they tend to ‘melt’ if cupcakes/cake, etc. are not refrigerated. What has your experience been? Thanks! 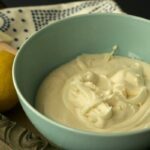 I’m in a very hot climate and I’ve been fine with room temperature, but you want to make your frostings nice and thick. Does it work using coconut oil instead of vegan butter. Thanks if you can help me! Do I need to double this to top a 13by 9 cake? No, I assume you mean a single layer 9×13, this would be enough frosting for that. I make a vegan chocolate cake with this frosting about once a week, and my boyfriend can’t get enough of it! Everyone is so hung-up on the wording. “Vegan butter” is margarine, people! There are dozens of brands available (Earth Balance, Smart Balance, Country Crock, Blue Bonnet, just to name a few). Maybe it’s because I live at a high elevation (7,000 feet), but when I use 5 Tablespoons of soy milk, it comes out really runny. Four Tablespoons works better for me. I would recommend adding the non-dairy milk 1 Tablespoon at a time until you achieve the right consistency. When you say 10 servings, does that mean it would be enough for 10 cupcakes? It looks great. I want to use it for my daughter’s birthday cupcakes! Hi Melissa, I was basing it off of a cake where you would get around 10 slices. This would definitely be enough for a full batch of 12 cupcakes. 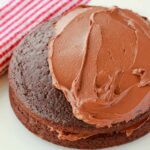 You could also have a look at the chocolate frosting on these gluten-free chocolate cupcakes or these classic vegan chocolate cupcakes. Thank you for this recipe! Do you use the paddle or whisk attachment of the mixer? Thank you!